As I mentioned a few posts ago, I'm trying to get back into my old habits of making all my meals from scratch again and not falling into the trap of using ready meals because I'm tired and fed up when I get back from work. It's also a lot cheaper, which helps to keep my spending down, essential now I'm trying to pay off my credit cards so I can get rid of them. Pasta is usually my go-to-stand-by meal when I'm watching the pennies and I absolutely love pasta bakes. They're versatile, you can put anything in them and they are so easy to make. But, believe it or not, I have actually found an even easier way. 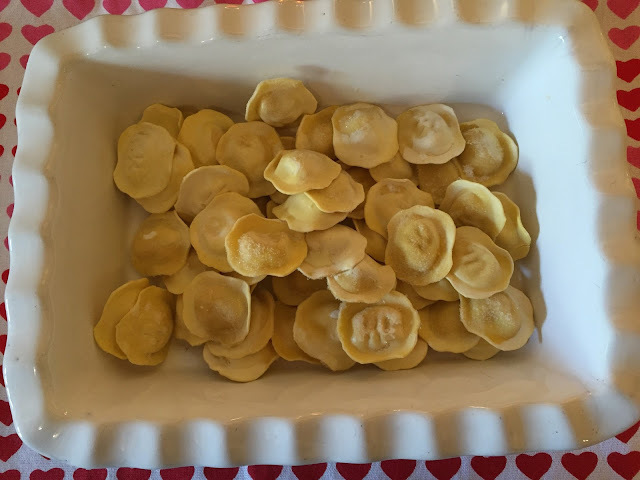 In my local Morrissons, they often have special offers on fresh pasta ravioli, which I love, so when it's on offer, usually at £1 per bag, I buy a whole load of them and pop them in the freezer. Then I simply use them straight from the freezer to make a totally delicious ravioli pasta bake. It takes about 15 minutes from start to finish and it hardly costs anything. I simply popped the frozen ravioli into a baking dish, fried the garlic in a little oil in a saucepan to soften it before adding the tinned tomatoes, the red pesto and the water. 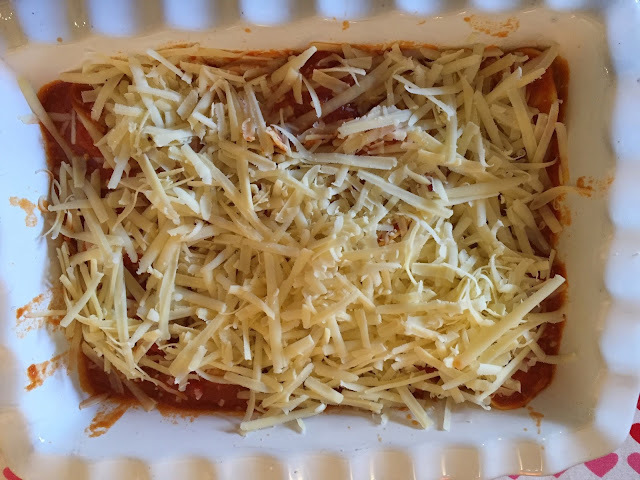 I added a pinch of salt and poured the tomato mixture over the ravioli, topped it with grated cheese, covered it with foil and baked it in the oven until the ravioli was tender. I usually serve it with a crispy salad and garlic bread for a deliciously filling supper but I didn't have any salad in the house and my salad leaves aren't ready to pick yet so I just dived right in. 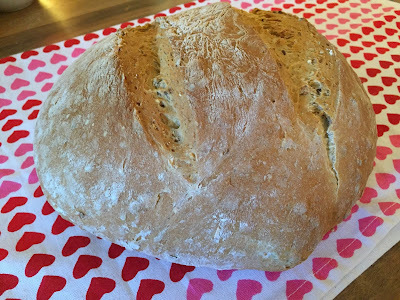 While the oven was on, I also popped in a loaf of bread that had been proving and rising for a couple of hours. I have found the most amazing flour. 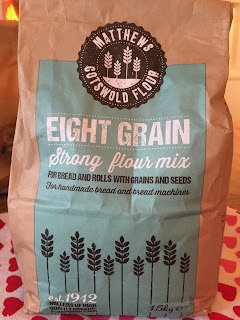 It's called Mathews Cotswold Eight Grain Flour ........ no idea what the eight grains actually are but it makes amazing bread with a lovely nutty taste. I got it from my local Aldi a few weeks ago. It's not a regular stock item in the shop and they only have it every so often so when I see it I buy 3 or 4 bags. At £1.70 ish, it's a bit more expensive than the bog standard strong white bread flour I usually get but it makes such delicious bread I really don't care. I've got the grandchildren staying over on Saturday night, so that Pasta Bake will be Saturday's supper - thank you! And I must try to find that flour because the bread sounds delicious. 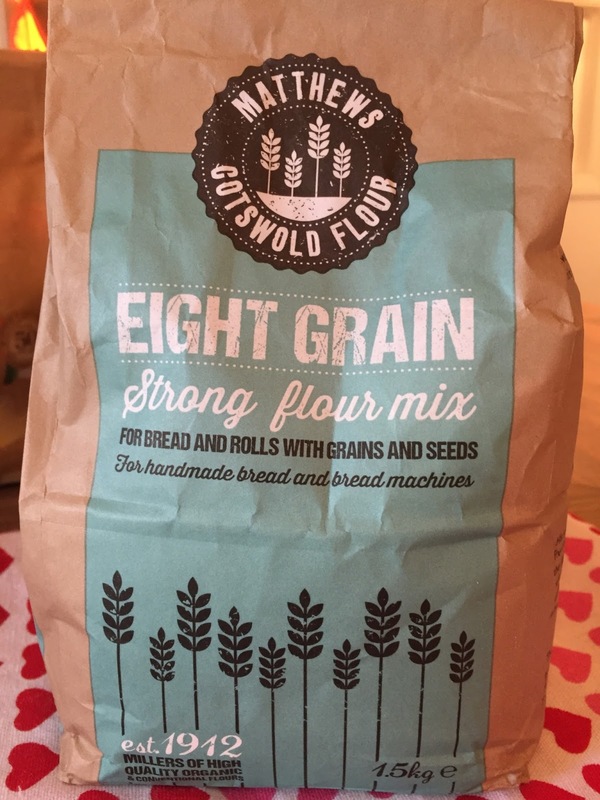 I have just discovered the cotswolds flours ( I now live in that area) and they are so good. 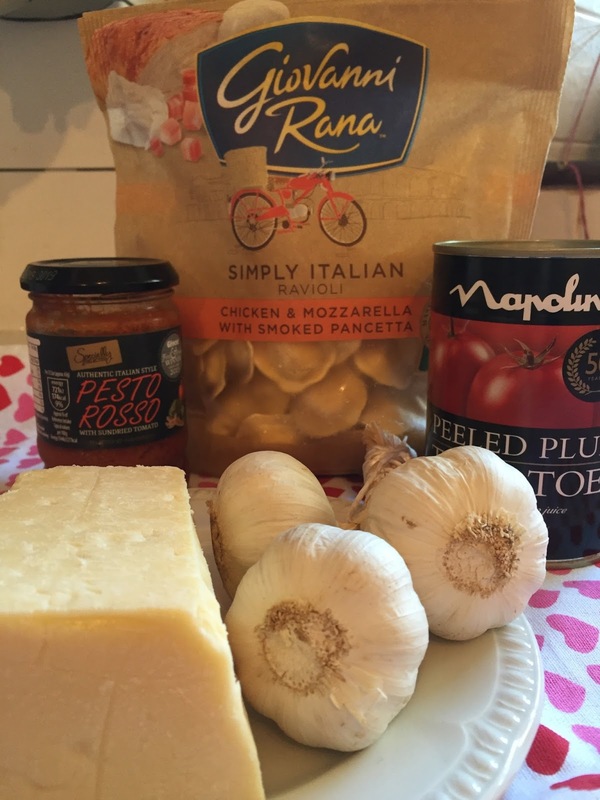 We use Giovanni's pasta too, excellent value.